Looking for a class of red wines that outperform its price segment and allows for virtually risk-free experimentation? Who isn't? The endless variety of wines available is proof that we live in a Golden Age of consumerism, but every product can't be a winner. Many are overpriced, mediocre, or just plain bad. Ironically, the risk of getting a disappointing wine often rises with cost and, therefore, expectation. Consider how likely it is to get an enjoyable Napa cabernet for $30 - it's a crap shoot. The same can be said for Brunello, Barolo, Burgundy, and many more of the higher-priced categories. But head to the store with that same $30 to the shelves of Australia, Southern France, Washington, and other pockets of value, and you're almost guaranteed a superlative experience. Of course, $30 is an arbitrary amount to illustrate the point. In reality, it's a highly personalized sliding scale. Personally, I prefer a target at about half that. Still, finding those pockets takes work; exploration, experimentation (grueling stuff, indeed.) So, when you happen on one, it's noteworthy enough to call attention to. To that end, let me introduce you to Montepulciano d'Abbruzzo Riserva (or MdA, R), the more serious older brother to montepulciano. Quick note of not-so-trivial trivia: Montepulciano is both a grape and a city. 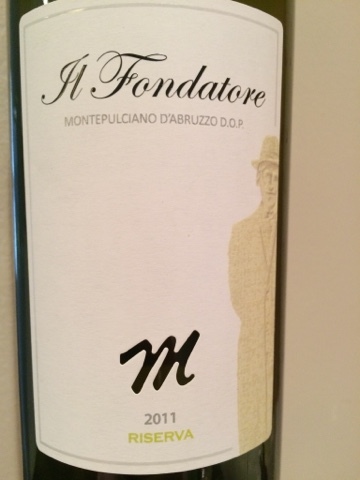 Montepulciano d'Abbruzzo is made from the monetpulciano grape from the region of Abruzzo, whereas Vino Nobile di Montepulciano is made from sangiovese grown around the Tuscan town of the same name. 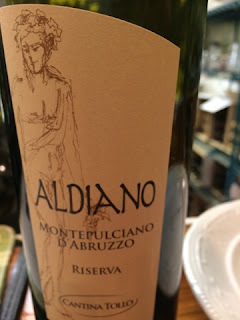 In case you didn't also swig this stuff from $6 magnums in your younger years, Montepulciano d'Abbruzzo is the oft maligned Italian grape most commonly seen in jugs, magnums of cheap Zonin, or haphazardly made sub-$9 bottles. In fairness, montepulciano has come a long way since those chugalug days. A few have been reviewed here, here, and here. What's worth sharing, however, involves recent exploration of the Riserva versions of these wines, which must be aged for a minimum of two years before release (six months or more of which need to be in barrel). There aren't many out there, but so far they're batting a thousand. These are big wines that carry quite a bit of heft, but exhibit soft, inviting fruit. Framed with noticeable, but unobtrusive oak and complementary acids that help outline the weight, these bottlings also tend to much more affordable ($15-20) than the aforementioned regions without sacrificing drinking pleasure. Below are two I happened across recently and which I'll gladly reach for again. But, much as I advise you to, I'll be grabbing almost any MdA, R I come across.